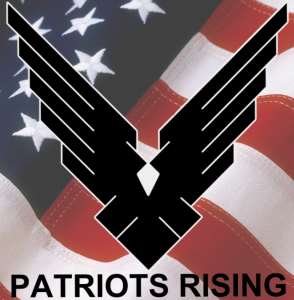 Patriots Rising was an idea that started out of frustration; frustration in our political and judicial system. Our nation has faltered due to corruption and self-serving politicians that have forgotten they represent the people. They have taken public office to advance their agenda, power and wealth at the expense of the American people. All great nations fail; history has taught us this, it’s just a matter of time before they implode from the corruption. Can a hand full of people change the course of history from repeating itself? No, but a majority of people can and that was our hopes for Patriots Rising. We knew it would take a lot of work to build up a substantial presence and we are still working around the clock to make that happen. We can make a difference and our voices will be heard. We had several goals but the two primary goals were to educate and advocate our freedoms and liberties as Americans. We knew we could make learning history fun and interesting. We also knew that millions of people thought the same as we did. That made the advocating part easy. Be honest and be true to your beliefs and people will listen. Doc is retired Navy and was a Hospital Corpsman for 20 years. Both her father and brother served in the Navy. As a mother of four Doc has spent her life defending our freedoms and liberties so her children, and their children could enjoy what so many take for granted. Doc is a Range Safety Officer, NRA Certified Instructor, handgun, shotgun and rifle Instructor. She’s passionate about training and teaching others about firearms and personal protection. She started shooting early in her life and her first firearm was a Dan Wesson .357 Revolver with interchangeable barrels. Jester spent 7 years in the Air Force as a Survival Instructor. Both his father and Grandfather served in the Army. Jester is a Range Safety Office, NRA Certified Instructor and handgun, shotgun and rifle Instructor. He started shooting at an early age with his first Daisy BB gun, then a couple pellet guns and then finally his first pistol, a Browning Hi-Power. In the Air Force Jester qualified on the M16 and the M9, his duty pistol.